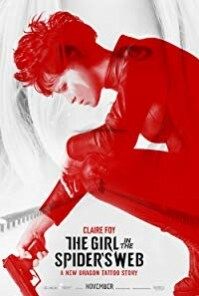 Plot: Young computer hacker Lisbeth Salander and journalist Mikael Blomkvist find themselves caught in a web of spies, cybercriminals and corrupt government officials. Starring: Claire Foy, Lakeith Stanfield, Sylvia Hoeks, Stephen Merchant. distributed by Sony / Columbia «The Girl in the Spider's Web» in the US movie theaters released on November 9, 2018 and has grossed over $18 million worldwide; dvd and blu-ray release date was set for February 5, 2019. Rent from Netflix and Redbox from February 5, 2019. «The Girl in the Spider's Web» in the UK released in movie theaters on November 9, 2018. The movie released on dvd and blu-ray on March 25, 2019.